I don't think I need a long intro for this blog. Instagram is my favorite application, no doubt about that. It was the platform where Julian and I met and started our #lifebytwo story. Even before Julian came into my life, Instagram is where I showcased my outfits and daily shenanigans together with Tumblr before it became curated. I can still remember when algorithm didn't exist and I can still scroll from yesterday's last post of my following. Instagram then became a tool of income along with my website; name it: sponsored posts, ads, collaborations, monetized posts, etc. It's always overwhelming (in a good way) to be able to collaborate and partner with different brands from all over the world. With that said, I know what to post and my Instagram is curated; timings, theme, color, and I'm having so much fun doing it. Aside from my personal life, social media not just Instagram plays a big role in my career. I work as a Content Director and our business is mainly social media. 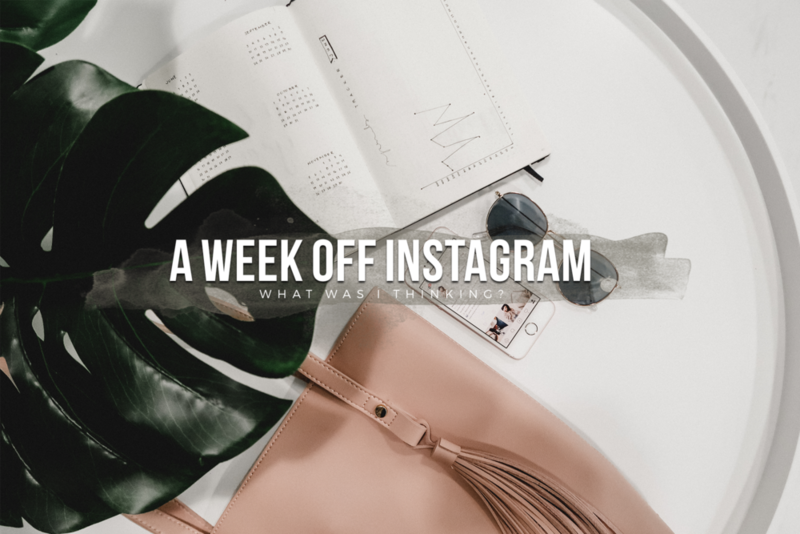 There's not a single day where I skip Instagram since I always check our clients' accounts. All of sudden, it became stressful. "I think I'm using Instagram way too much", I told myself. I'm on social media for 8-hours as a work requirement then I come home and take care of my personal business which means another couple of hours on the phone. Sometimes, I just find myself scrolling and scrolling and scrolling as if I'm trying to beat Instagram's algorithm. I follow a bunch of creative people! But at the same time, my insecurities are being put in the spotlight. "Wow! She's so pretty!" "Her outfit is so beautiful!" "What a beautiful skin!" "So hot!" "These people are so good at taking photos!" Those are positive words but then again, I follow it up with "Wow! She's so pretty. Why am I so fat? Why don't I have a beautiful skin? Ugh. I'm so bad at this." It felt like I was not doing enough. I was beating myself up. I grew weary but I couldn't stop. I couldn't stop because I was trying to prove myself that I was not affected and that I was just overreacting to things. I was in denial that social media was eating me alive. Kinain na ako ng sistema mga bes! Until one night, it was 2 am and I was wide awake. I was staring at the ceiling and my mind was all over the place. I couldn't sleep. It felt like my heart was gonna explode any minute that time. I closed my eyes and God reminded me, "My identity should be anchored to who God is." I prayed and cried out to God. I asked him, "Why am I feeling like this? ", and He answered, "align your truth with my truth." What was I doing wrong? I post about my lifestyle and my captions are genuine. But why did it feel like I wasn't doing it right? I realized that social media was bending the truth about my identity because I was basing my capacity to create on what people comment about me, how many likes I get. The truth is, engagement doesn't define my worth. That's when I decided to take a break on Instagram and Twitter. I needed a restart. So, I deleted both apps on my phone. I tend to keep things to myself because I feel like no one can relate to me, but Julian acted otherwise. He comforted me with God's word and prayed for me. What did I do during my social media break? 3. I observed. I usually sleep in the bus. If not, I'm always on my phone. This time, I looked around. I saw people working under the heat of the sun without even complaining yet here I am, problematic about my life because of social media. Have you seen those guys who carry folded boxes on their bicycles? They were sweating but that's how they survive this life. I say a little prayer whenever I see a worker/laborer. Why am I back on social media? Have you experienced this before? I would love to hear your thoughts.